Powerwave - Wavefront Technology Solutions Inc.
Wavefront’s patented Powerwave process is an injection technology that improves the flow of fluids in geological materials including sedimentary soils and fractured rock. These materials are composed of a solid matrix and pore structure, which contain fluids such as oil and gas. These fluids move through pore networks in preferential flow paths established during the formation of the reservoir. Powerwave tools generate a high amplitude, low frequency, dynamic fluid pressure pulse that causes a momentary elastic flexure of the pore structure. This pressure pulse moves fluid into and out of a large number of pore networks, thereby obtaining a move uniform injection front and resulting in optimal placement of fluids for well stimulation and waterflooding operations. One of the major challenges to maximizing fluid injection during a conventional well stimulation such as acidizing is that every oil or gas reservoir rock is more or less heterogeneous at all scales (micro, mega, and pore) which leads to disproportionate injection outcomes. Generally, the higher the level of reservoir heterogeneity the more difficult it becomes to achieve maximum fluid distribution or conformance. Improving conformance in a non‐homogenous material such as a hydrocarbon reservoir inherently means improving flow through lower permeability regions. Ideally, during a conventional well stimulation using a treatment fluid such as acid, we wish to move the fluid through the majority of the rock volume but the physical constraints of fluid flow negatively impact that ideal outcome. Powerwave provides for high inertial fluid momentum which improves the flow efficiency of the wellbore, the near wellbore region, and the reservoir. The nature of fluid displacement energy ensures that pulsed fluid will penetrate the rock matrix proximal to where the Powerwave tool is placed thus achieving enhanced fluid distribution. Compared to conventional stimulation approaches dynamic fluid pulses associated with Powerwave tools have been demonstrated to bring significant financial benefits to well stimulation without impacting results including: reduced chemical costs; greater post-stimulation sustainability; and, better overall post-stimulation well performance. 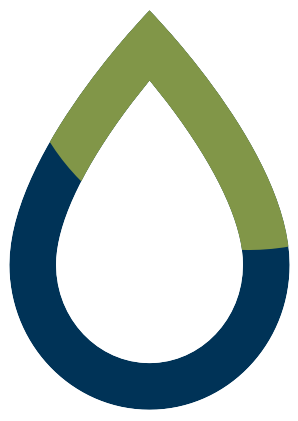 Powerwave achieved an approximate 30% cost savings per stimulation due to reductions in chemical costs; acid storage tanks; mixing and pumping time, etc. Powerwave is a major step change which vastly improves established conventional flooding approaches in secondary and tertiary oil recovery operations. Converse to conventional approaches where sweep efficiency of the flooding fluid is adversely affected by preferential flow paths, effective fluid placement with Powerwave is achieved by creating energy-packed, dynamic fluid pulses that provide for a more uniform injection front. 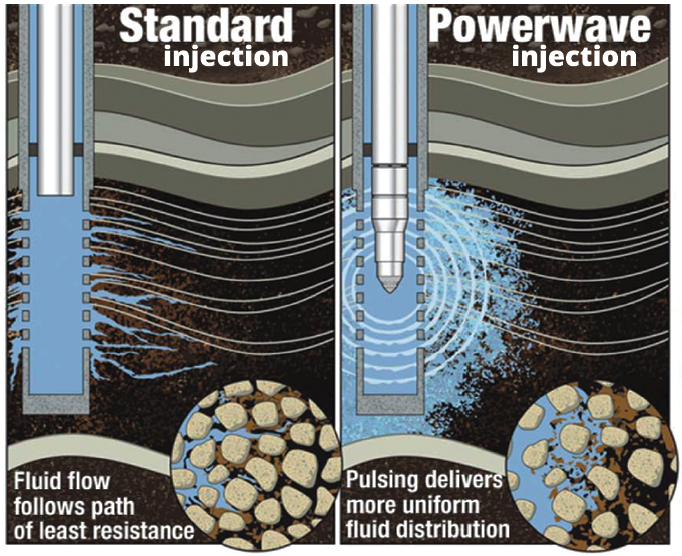 In various reservoir settings Powerwave has proven to be an effective and economical approach to improve sweep efficiency in the reservoir thus leading to increased oil production; lower water-cuts; improved decline rates; and, increased estimated ultimate oil recovery. 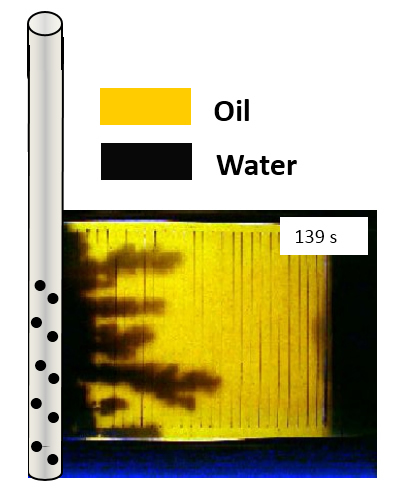 The ratio of oil to water is called the oil cut. 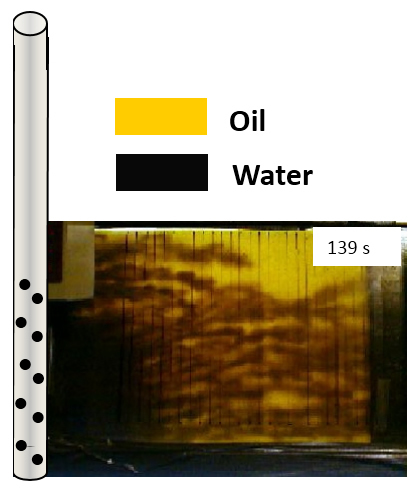 In most fields the oil cut steadily decreases with time as ever increasing amounts of water are produced. Many fields are abandoned when the oil cut drops to 5%. Powerwave tools make existing wateflood injectors more efficient. More efficient injection means that, in general, fewer wells may be required to produce a greater amount of oil. Powerwave extends the field life of old fields by reversing declining oil cuts and delaying abandonment.